Afghan measures approximately 40" wide x 50" long. Red Heart® Super Saver®, Art. E300, 100% Acrylic (8 ounce/452 yard solid color; 6 ounce/348 multi color skein): 24 Ounces No. 311 White CA. RED HEART® Ltd. "Foxy™'', Art. E724, 100% Polyester (1.76 ounce/89 yard ball): 1 Ball No. 9387 Indigo CB for afghan; 1 ball No. 9387 for trims. Circular Knitting Needle: 6mm [US 10] - 29". Crochet Hook: 6.5mm [US K-10.5] for pillow and lampshade trim. Yarn needle; sewing needle and thread for applying pillow trim; glue gun and glue sticks for applying lampshade trim. GAUGE: 13 sts = 3 ½” ; 25 rows = 4” in pat. CHECK YOUR GAUGE. Use any size needle to obtain the gauge. With CA, cast on 149 sts. LOWER BORDER: K 5 rows. Row 1 (Right Side): K3, * sl 1, K1, psso, K4, yo, K1, yo, K4, K2tog; rep from * to last 3 sts; K3. Rows 2, 4, 6, 8, 10: K3, P143, K3. Row 3: K3, * sl 1, K1, psso, K3, [yo, K3] twice, K2tog; rep from * to last 3 sts, K3. Row 5: K3, * sl 1, K1, psso, K2, yo, sl 1, K1, psso, yo, K1, yo, K2tog, yo, K2, K2tog; rep from * to last 3 sts; K3. Row 7: K3, * sl 1, K1, psso, K1, yo, sl 1, K1, psso, yo, K3, yo, K2tog, yo, K1, K2tog; rep from * to last 3 sts; K3. Row 9: K3, * [sl 1, K1, psso, yo] 3 times, K1, [yo, K2tog] 3 times; rep from * to last 3 sts; K3. Rows 11 and 12: K all sts. Change to CB. Rows 13 and 14: With CB, K all sts. Change to CA. Rows 15 and 16: With CA, K all sts. Rows 17-32: Rep Rows 1-16 EXCEPT work Rows 13 and 14 with CA. Rep Rows 1-32 nine more times. Note: Last 5 rows will automatically form the Upper Border. Bind off last row in K. Weave in ends. Lampshade Trim: With 2 strands of CB held together as one and crochet hook, make a chain long enough to fit, slightly stretched, around upper edge of shade. Fasten off. Glue in place, overlapping the ends of the chain and hiding the yarn tails under the trim. Repeat for lower edge of shade. 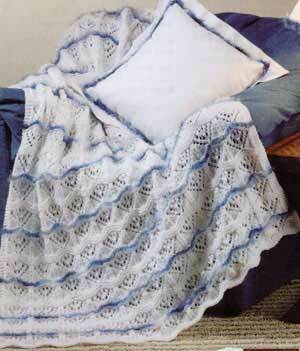 Pillow Trim: With 2 strands of CB held together as one and crochet hook, make a chain long enough to fit, slightly stretched, around edge of pillow. Fasten off. With needle and thread, sew in place around pillow, overlapping the ends of the chain and making sure the yarn tails are under the trim. ABBREVIATIONS: K = knit; mm = millimeters; P = purl; psso = pass the slipped st over; pat = pattern; rep = repeat; sl = slip: st(s) = stitch(es); tog = together; yo = yarn over; * = repeat whatever follows the * as indicated. [ ] = repeat directions in brackets the number of times specified.